Eric Bolander is from Garrison, Kentucky,where he is an art teacher by day and a singer-songwriter by night. This album was recorded in Lexington Ky and produced by Duane Lundy (Sturgill Simpson). Listen to the title track to see how you are captured immediately by this masterpiece as he sings, “Why don’t the wind blow me away?” Slowly, almost thankfully, always mellifluously, Bolander accepts what life presents to him, and here that sentiment is echoed perfectly by Trenton Jenkins’ soft banjo. 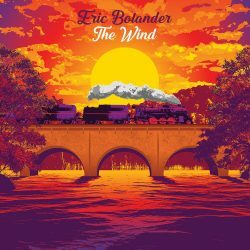 “Tried and tested, but I’m here to stay,” sings Bolander, and one gets the feeling that he knows the score in every sense! The songs here all depend on this power and depth of simplicity. ‘Oh Lord’ is an unforgettable track, a prime example of his story telling skills. He is able to draw tears by just alluding to certain thoughts, moments and places: “Driver seat,” “River bed takes another life,” “Burnt alive,” “Granny weeps, holds my mother tight,” and his cry, a howl really, “Payment!” All this perfectly supported by Seth Murphy’s cello. ‘Fly’, is another story, this time about the birth of Bolander’s daughter, Ava, that tells of “Life coming through the window of love.” His voice implores: “Call and then I’ll get it right!” He remembers his first sight of his daughter, “When she looked at me for the first time/My heart filled up like a hot air balloon.” Not only is this a song about getting it right, confirmed by fiddle and cello, it is one of those rare compositions that capture you. To deepen the effect further still, another version of the song brings the album to a close with the addition of his daughter’s name, ‘Ava.’ ‘Purple Rain,’ the only song on the album not written by Bolander, still shines as an outstanding cover, an arrangement that includes banjo, cello, a fading saxophone and his commanding mellifluous voice, “Oh yeah! Honey I know times are changing!” On ‘The Road’, with the supportive and steady support of cello and banjo, as always, he presents a picture of life and a way of coping with it: “Time has got a hold on me … I won’t let go.” It is the steady determination in the lyrics that engage and support the listener. So it is with the album as a whole. The excellent cover of the album, designed by Jumbo Valentine, is worthy of mention. Here is a painting of a train crossing a railroad bridge along Kinniconick Creek in Garrison at sunset, from a photo taken from Bolander’s own collection. A taste here of his other profession and certainly one of the more notable CD covers around. All in all, summing up how prestigious and memorable ‘The Wind’ is.